I remember it vividly as if it were yesterday – the Wall St. debacle of 2007-2008. I was surfing the net on my day off when I saw a news crawl saying that Indy Mac had folded. I then saw a news report that had a reporter at the scene of my local Indy Mac branch and there must have been a line of people going around the block. They were there for their money. The look of despair was something terrible, as some folks would potentially lose more than was the government would guarantee on their savings. Things got worse in the coming days and the world did plunge into darkness for a bit. Nearly 10 years later we have The Big Short – the film that seeks to demystify what and how the actions of some of the biggest banks on Wall St. manipulated various stocks and sold the repacked products to an unsuspecting investor-base. I would not say that The Big Short is the “for dummies” version of events but it does help that film is peppered throughout with various high-profile cameos breaking the fourth wall to explain what some of the more advanced terms are. Michael Burry (Christian Bale) is now uber-investor-wonder-kid who invests for his company on a no questions asked basis. One day, as Michael reads thousands of documents and sees that folks have been hit with sub-prime loans that have no intention of being paid back – decides that he will bet his company’s assets on these loans to eventually go toxic. The goods news is that he will make billions of dollars on the gamble but the bad news is that the economy will tank and millions will lose their homes and life savings. Also, it will take a couple of years before Burry’s forecast comes true. In the meantime his company has to pay lots of money per month to float the interest payments that his bets hedge on. Other folks on the floor and in rival departments and companies get wind of what Burry is doing – some by luck and some by getting a wrong call mixed up. Jared Vennett (Ryan Gosling) and Mark Baum (Steve Carrell) are two other people with the inside scoop. None of these guys even know each other directly – they just know of each other, because as big as Wall St. is most folks don’t seem to care about their peers only what they can offer and what coattails they can ride on. As more and more people in the USA continue to default on their mortgages Burry’s forecast continues to gain steam but his boss and those that have invested in this fund that Burry manages get scared some decide that they would rather cash out and not have anything to do with Burry’s gamble. Meanwhile Jared doesn’t care and will milk it for all it’s worth and Mark seems like he wants to find a middle ground. He’s still an investor, a wealthy one, but he’s got a bit of a moral conflict going that seems to come out from within him at all the wrong moments that make his groups of colleagues worry. After all, his colleagues are also there to make money, too. The Big Short was a surprise treat of 2015, which told the story of what led up to these frauds that tanked the world economy. I watched the film twice on Blu-ray and thought it was phenomenal and clever. I don’t profess to be an economics expert but the film does lead you about in a simple manner and seeks to explain how we got to where we got and whether it will happen again. It’s like being there. There was another film that got a limited release in 2015 called 99 Homes that played more on the “man on the street” vibe (literally) than what The Big Short did. The Big Short was what went on behind the scenes and 99 Homes is what happened due to the mess behind those scenes – the after effect. As a double-header, both films gave the general movie-going audience a one-two punch of epic proportions in a relatively easy to understand fashion. The Big Short also received lots of accolades and folks also received awards and recognition. It’s not a fluke of a movie to be sure and it did eventually make it to my Top-10 list of films of 2015. If you need a film that will guide you about in an entertaining fashion and give you a crash course on what went wrong in the mid-2000’s then The Big Short is recommended. If you want a stronger shot to the gut then pair it up with 99 Homes. Just remember: the most outrageous parts of The Big Short really happened. The Big Short is presented in 1080p, 2.35:1. The image is consistently strong and only suffers from a few instances of softness. Contrast and sharpness levels are stable and I did not notice any instances of banding or pixilation when it came time to checking out the color wheel. Dirt, noise, artifacts, etc., were also not a problem. This is a near reference disc when it comes to picture quality. would not think that a film like The Big Short would have such an active soundtrack and that’s where you would be wrong. There are several instances where Christian Bale’s character is playing drums along to Slayer and various other heavy metal songs and he goes crazy on the double-bass pedals. The subwoofer went wild during those scenes. Dialogue levels, and this is a dialogue heavy film, were perfect, and the surround sound channels provided some nice depth and separation. 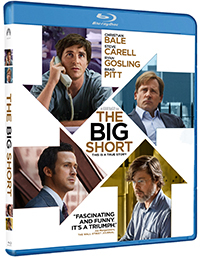 The Big Short on Blu-ray contains deleted scenes and several featurettes and interviews that are not necessarily fluff, and are quite entertaining in their own right. Everything in the supplements section is presented in high-definition, as well. A DVD and Digital HD Copy are also included. The Big Short is a serious drama of serious events and is wrapped around a quirky structure that breaks the fourth wall on occasion. It has a star-studded cast and everyone nails their role. The Blu-ray has terrific video and audio and the special features are also decent. There’s a reason The Big Short was one of the best films of 2015. The Blu-ray is highly recommended! The Big Short is a fantastic and scathingly accurate and funny film describing the events that led to the economic recession of 2008. The Blu-ray has great video, audio, and special features. Pair The Big Short up with 99 Homes and you will have a dynamite double feature.